The CAT-4-1-INCH, for 25.4mm cores, handles labels up to 155mm wide and will wind a roll of labels up to a 220 mm diameter. 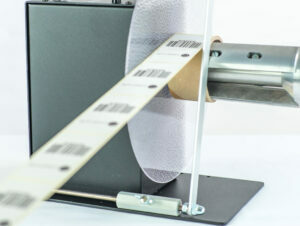 An external commande interface on the CAT-4 allows to support direct control start/stop by the barcode printer (check compatibility with your printer vendor). The CAT-4 offers also an optional adjustable Start Delay to allow the printer to execute back-feed withtout resistance from the rewinder.